Hi! 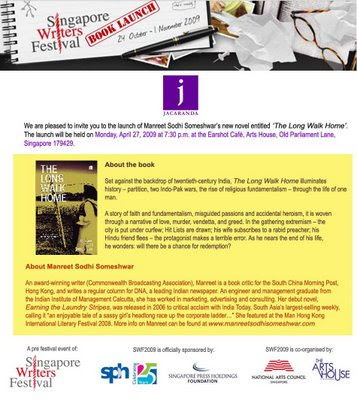 I am pleased to invite you to the Singapore launch of The Long Walk Home. If you are in town, do drop in. The venue is Earshot Cafe at the lovely Arts House, and you can look foward to an evening of books and banter. See you then! Manreet, Congrats on the second book. Great going. Mightily impressed and yes, shall be shelling out for purchasing the book when it releases in aamchi Mumbai. Regards to Prossy. And yes, a minor shabaash tap to him as well.